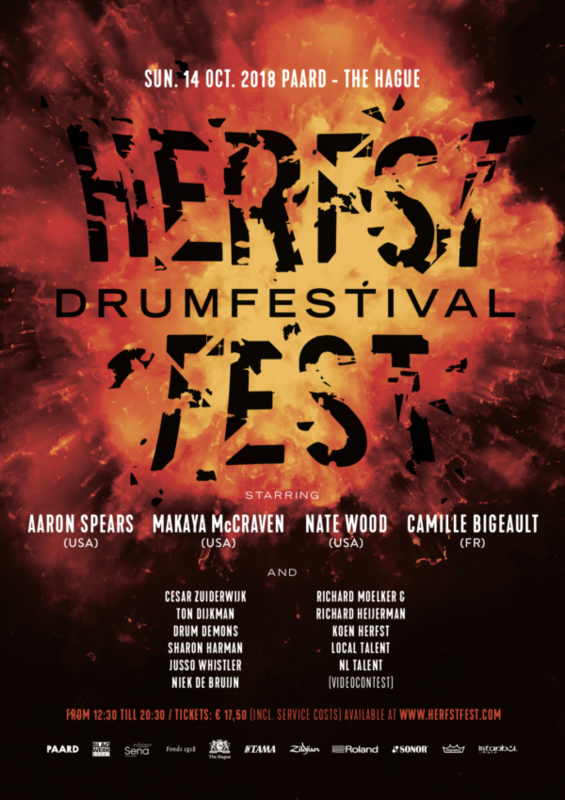 The popular American drummer Aaron Spears, who worked with, among others, world stars Usher and Ariana Grande, will take care of a clinic on drum festival Herfstfest the 14th of October in Paard. Also drummers Nate Wood (USA) and Camille Bigeault (FR) shine on the fourth edition of this unique percussion spectacle. More names of our line-up will be announced later. One of the biggest names from the American drum scene is Aaron Spears. Thanks to his incredible skills and groove, he worked with world stars as Usher and Ariana Grande, and played with James Brown (!) on the Grammy Awards, one year before he passed away. Spears began as a gospel drummer, and has grown to one of the most influential drummers of the last years. ‘’I know he will inspire our visitors, for sure,’’ thus organiser Koen Herfst. And Aaron isn’t the only amazing talent. Nate Wood and Camille Bigeault will also perform at Herfstfest. Drums, bass and keys played by one person? That is exactly what the American Nate Wood does with his solo-project ‘fOUR’. His videos were shared massively in Facebook, where the multi-instrumentalist became world famous with. He made furore before with the high-profile and Grammy nominated jazz-group Kneebody. She is only 27 years old, but the French drummer Camille Bigeault is a virtuous in playing the so called ‘polyrhythms’, where every limb is playing a different rhythm. 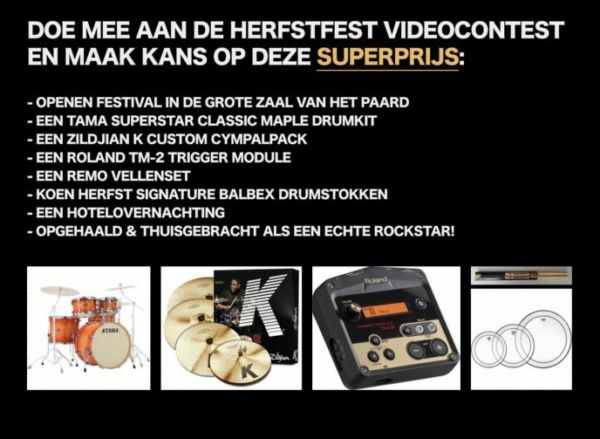 Organiser and drummer Koen Herfst met her during a tour through the drum sheet factory of Remo in Los Angeles and decided within seconds, that the Dutch public should get to know her inimitable play. Drum festival Herfstfest is the ‘place to be’ for everyone who has something with drumming. The program will be spectacular, with performances and workshops by a lot of great drummers in the Big- and Small Hall, a drum fair, jams and ‘shed sessions’ in the café, speed competitions, give-aways and ‘drum food’.